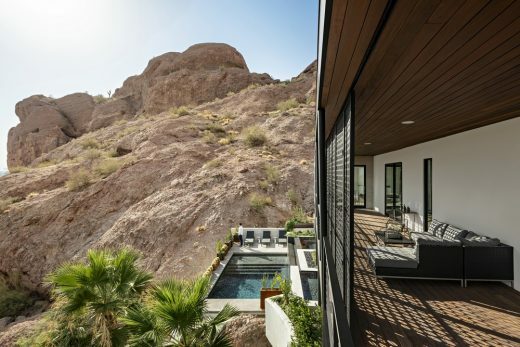 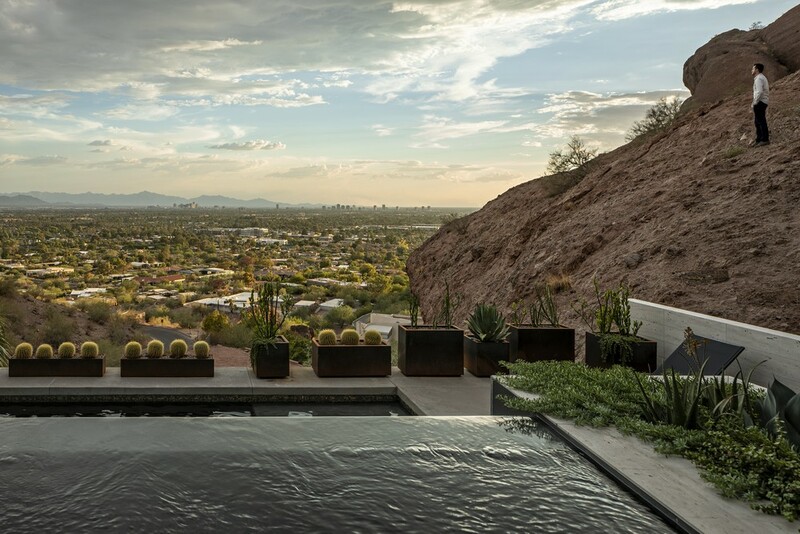 Clinging to the side of Camelback Mountain in Phoenix, Arizona, a Spanish Colonial Revival style house has been transformed by architecture firm The Ranch Mine into the Red Rocks residence, a dwelling that creates and elevates a variety of experiences with both the natural and man-made environment. When the homeowners approached Claire and Cavin Costello of The Ranch Mine to redesign their mountainside home, they were frustrated by the thick columns that interrupted the views, the heavy clay tile roofs and dark beams, and the floor plan that focused more on a ceremonial entry than the indoor/outdoor lifestyle they craved. 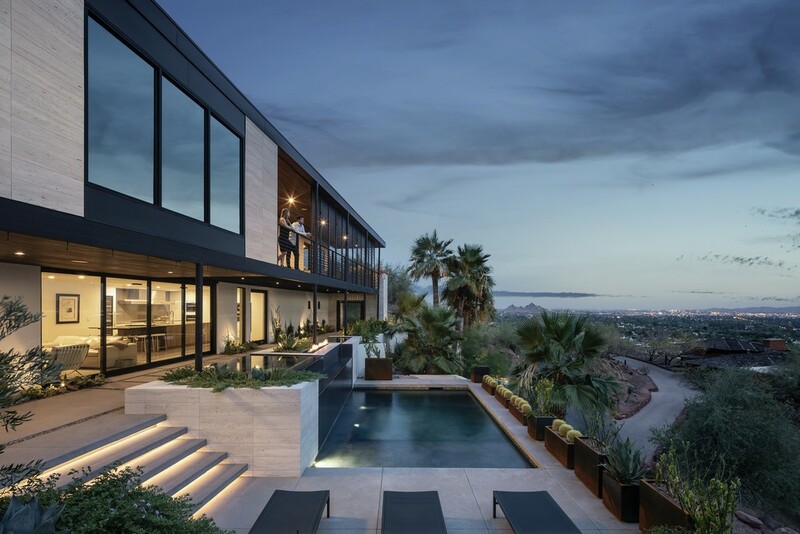 It was clear very quickly to the design duo that although the Spanish Colonial Revival style can be beautiful in the right situations, the style of this home was repressing the potential of the site, or more simply put, the house was style over substance. 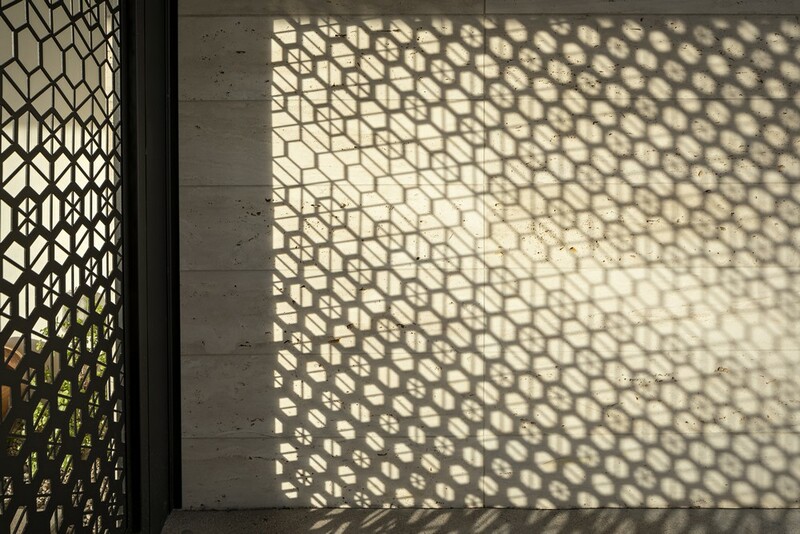 The first move to remedy this situation was to strip back the additive design features, leaving a simple, 2 story stucco box. 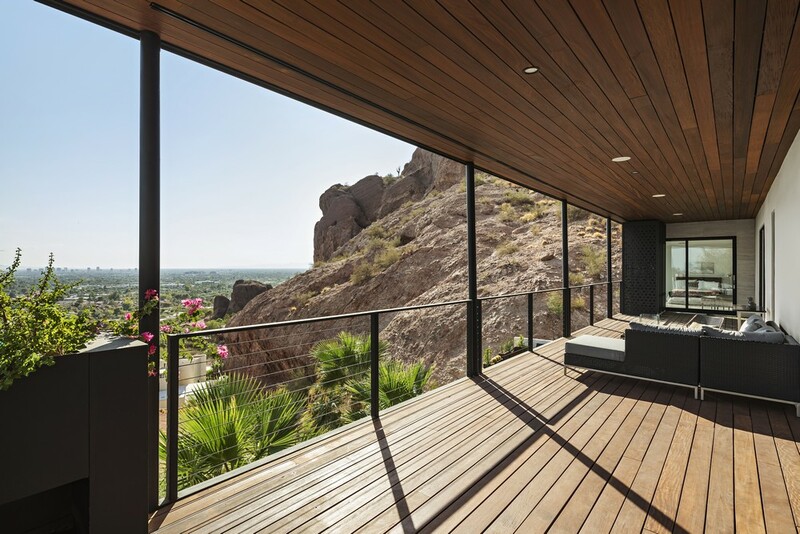 Inside the box, The Ranch Mine rearranged the floor plan to prioritize the connection between the living spaces of the house and the primary views, including a new steel, glass and wood stairs to a different location to allow for a view from the rear of the house through the front and to the valley beyond. 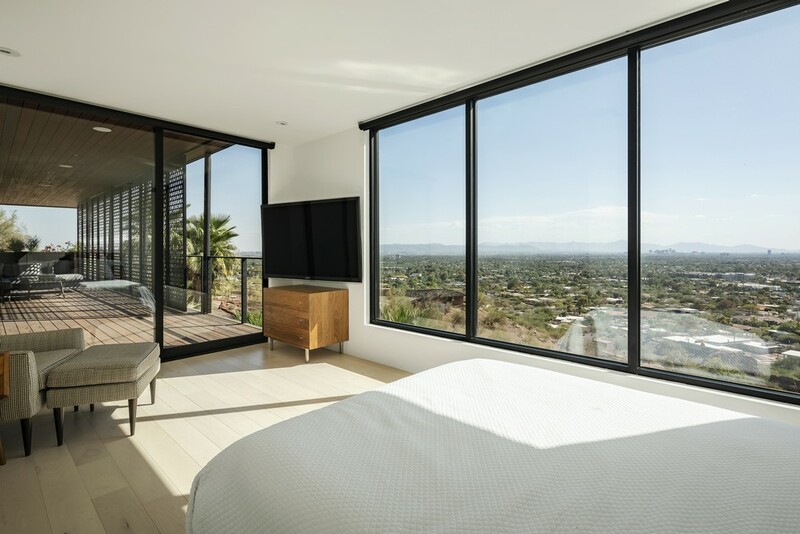 An additional ensuite bedroom was added via a second story addition clad in unhoned, unfilled vein-cut Veracruz limestone that cantilevers out over the mountain to preserve the maximum amount of outdoor living area and disturb no more space than the existing house footprint. 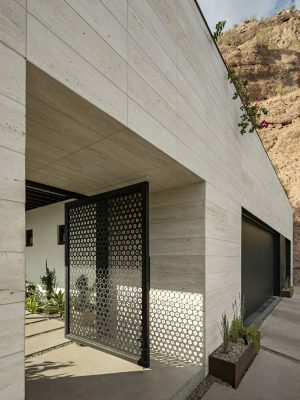 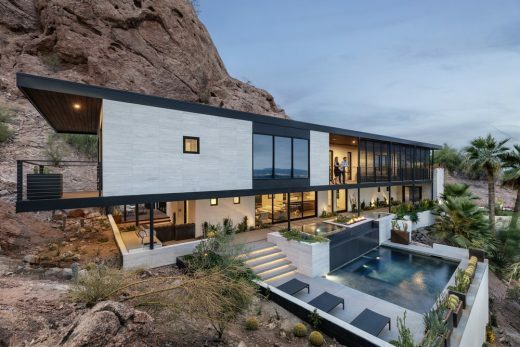 Rather than mimic the red sedimentary sandstone of Camelback Mountain, limestone was chosen to make the addition appear like the calcite veins that often appear in the red rocks marking their moment in time. 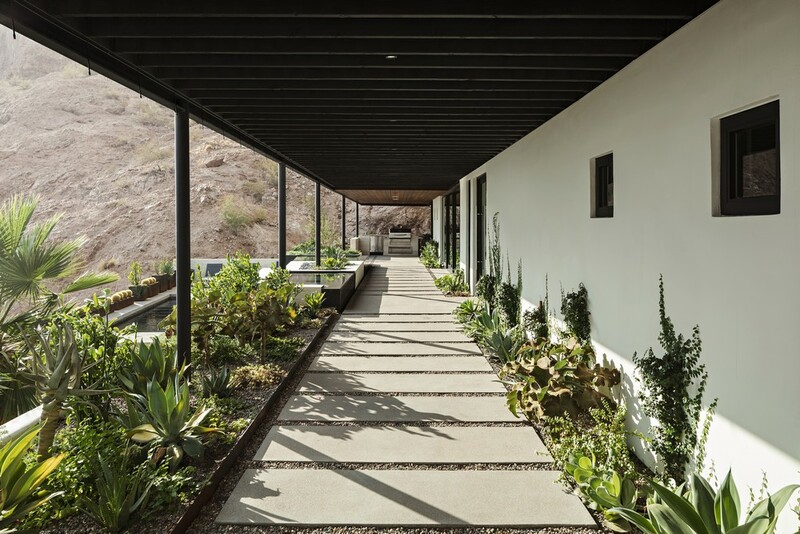 Along with this enclosed space, over 2000 square feet of shaded exterior patios were created, extending the living of the house in every direction and providing shade for the interior spaces. 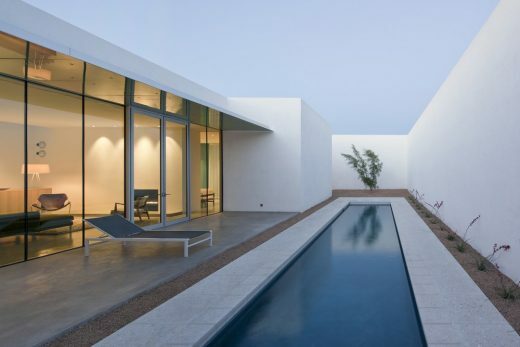 The first floor covered patio, accessed by a custom pivot gate by Bang Bang Designs, is lined with misters to keep the space cool all year round in the desert heat and transition the open living space to hot tub and firepit and down to the pool area. 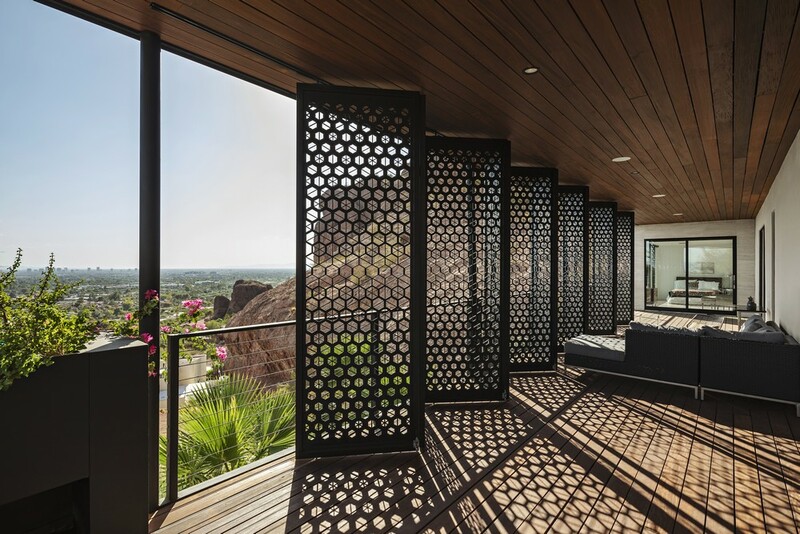 The large south facing second floor patio, with an Ipe ceiling and floor, features bi-folding custom steel screens (also by Bang Bang Designs) that help shield the deck from the harsh desert sun while still allowing the breeze to come through but can be folded aside at dusk to take in the famous Arizona sunsets. 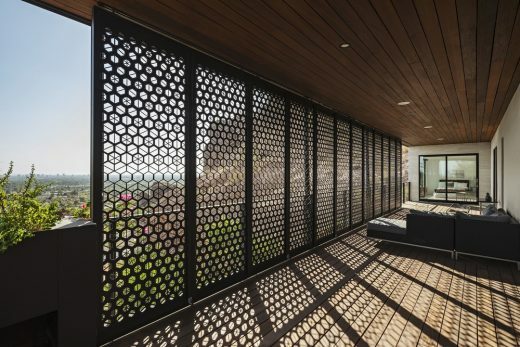 The screens feature a custom hexagonal pattern that is denser at the top and the bottom leaving the more viewable area at eye level while sitting down. 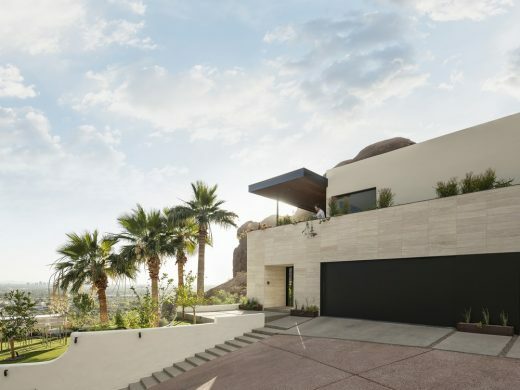 Just to the side of this area is a walking deck with custom planters that bring the desert up to the master bedroom, adding color and invigorating fragrances. 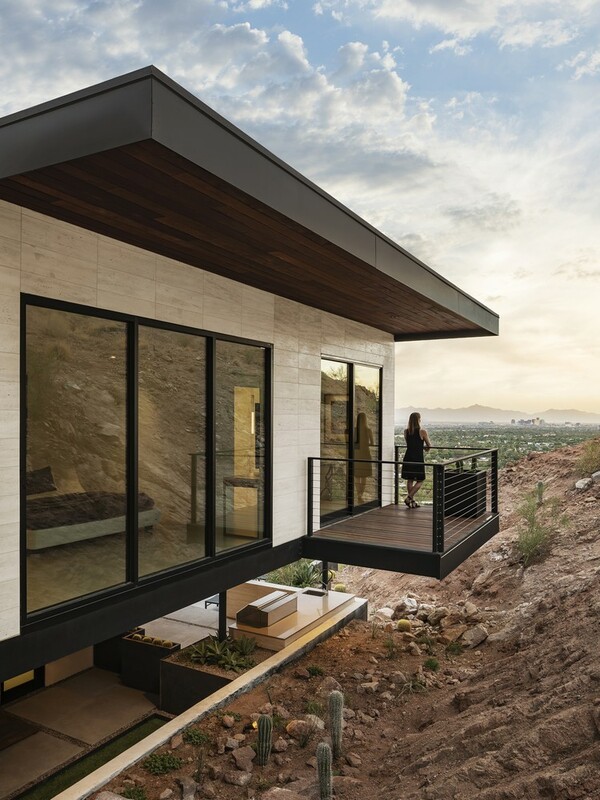 Off of the new second floor bedroom, a modern take on a Juliet balcony cantilevers out, almost kissing the mountain, creating a powerful connection and an intimate moment. On the interior, a low maintenance, exposed concrete floor was poured on the first floor to cover the extensive amount of work that needed to happen due to the failing plumbing and structural infrastructure of the existing house and maple wood floors were kept for the second floor. 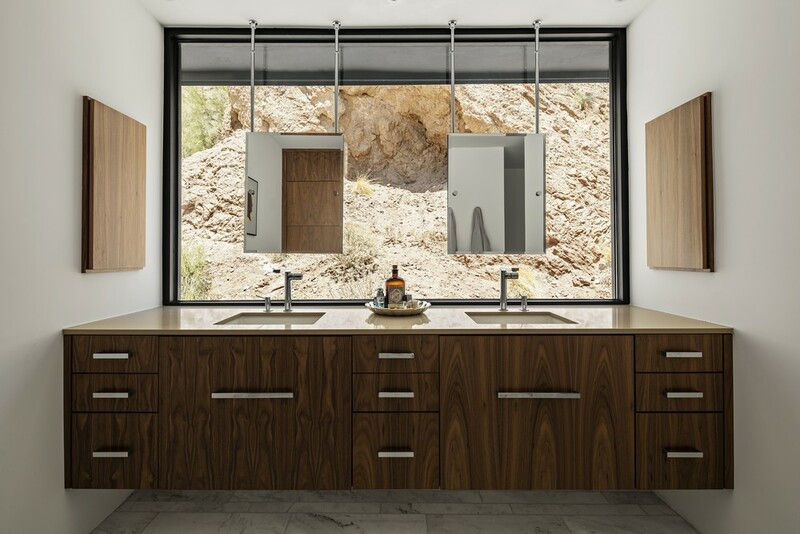 A fairly neutral palette of walnut and white cabinetry with a variety of quartz counters and marble tile were used throughout to keep the red rocks as the star material. To highlight this, bi-folding glass doors and clerestory windows were added to the corner of the living and dining room to access a quiet walkout patio and mirrors were floated above the master bathroom vanity in front of the raw mountain face to visually anchor the home to its unique site. In the front addition, large windows immerse the homeowners in the view and a small square window in the steam shower provides a peekaboo skyline vista. 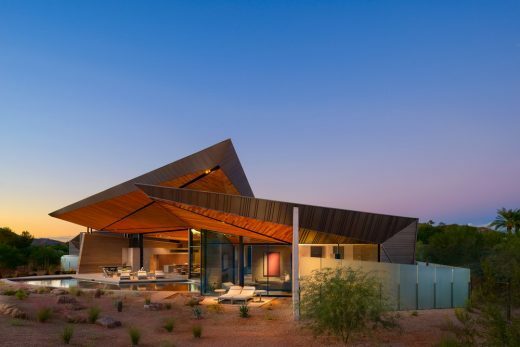 While design style is likely the most popular home design topic, with websites sorted by style and guides that “figure out your design style,” the “Red Rocks” residence revealed how a prescriptive style limited the potential of the site. 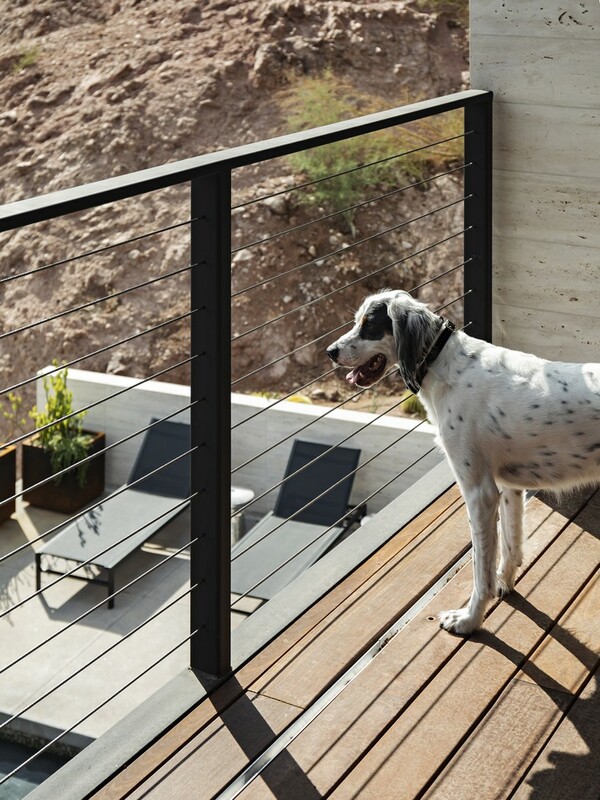 The remedy was throwing out the rules and designing for amazing daily experiences. Ultimately, homes are for the inhabitants and they should open up possibilities and connect us with our world. 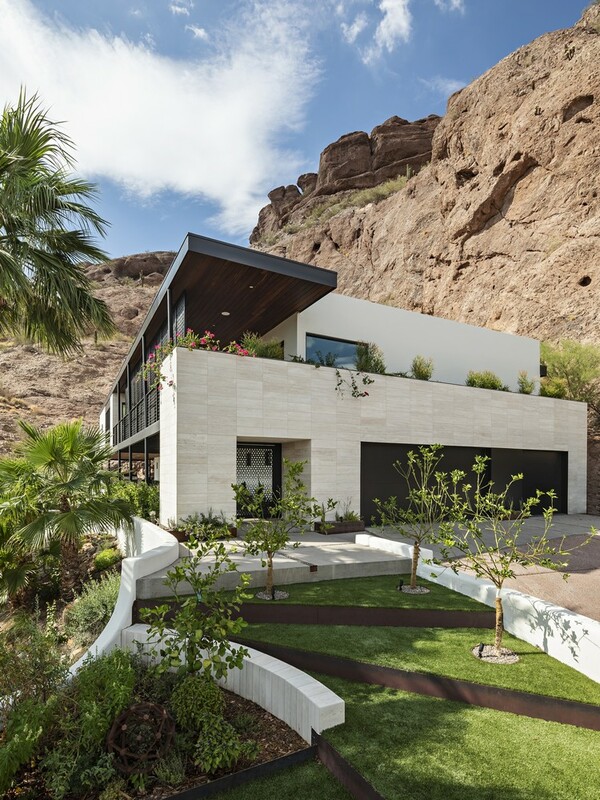 Landscape Architect: The Green Room Inc.